This is a chart (time unknown) for Jordan Belfort, the real-life inspiration for the outlandish stock market con-man portrayed by Leonardo DiCaprio in Martin Scorsese's The Wolf of Wall Street. I've mentioned at least a few times that the charts of criminals resemble the charts of (non-libertarian) politicians, and that the charts of thieves resemble the charts of Left-wing politicians in particular. Belfort gives us an example of this phenomenon. Rather than put the Sun on the First House cusp as I usually do for noon charts, I've left this chart in my default house system. Neptune in the Second House of money for the noon chart corresponds well to Belfort's financial deceptions. 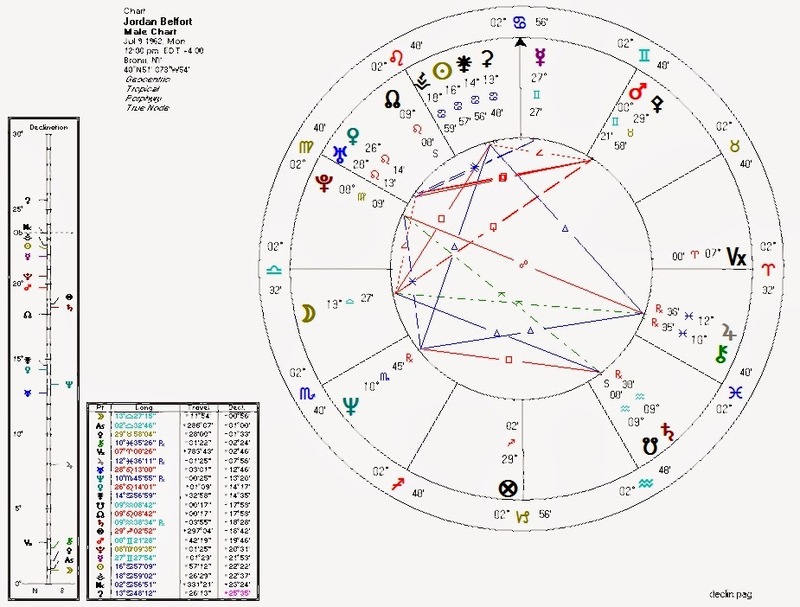 Saturn and the South Node in the Fifth House for this chart corresponds well to his extreme ego-insecurity and to his migration from a (Fifth House) investment mogul to an (Eleventh House?) sales trainer. Putting the Sun in the Tenth would reflect his public visibility his leadership roles, and his orientation towards achievement. The Moon in the First House may reflect how he "nurtured" his compatriots-in-crime, and Jupiter-Chiron in the Sixth House opposite Pluto in the Twelfth House may reflect his energetic workplace (Jupiter in the Sixth), his bizarre diet habits (Chiron in the Sixth), and his eventual betrayal of his employees (the Pluto opposition from the Twelfth House). Without an official time of birth, noon works very well. Pallas/Ethics: Pallas is widely square Pluto, and her ruler Venus is widely/indirectly conjunct Pluto and sextile Mercury. There's a hint of ethics here, but Pluto arguably overwhelms it. Venus/Second-House/Economics: Neptune is quintile Venus, trine Sun (ruler of Venus) and, in the case of a noon-ish birth, in the Second House. This moves Belfort's economics solidly to the Left/Neptunian paradigm. Combined with a compromised Pallas this opens the door to theft (known as "taxation" in the charts of politicians). Sun, Jupiter-Chiron, Neptune Grand Trine: suggesting a salesman/prophet (Jupiter) of dreams (Neptune) to wounded personalities (Chiron). Venus-Uranus conjunction: suggesting financial (Venus) innovation (Uranus) and perhaps his frenetic (Uranus) womanizing (Venus). South Node conjunct Saturn and quincunx Pluto: loss (South Node) of power (Pluto) and/or authority (Saturn). Were Belfort in politics rather than the private sector, he'd probably still be in office.